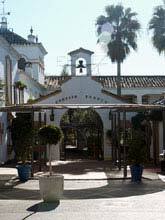 Hotel Cortijo Blanco, San Pedro de Alcantara, Costa Del Sol, Spain. I have now stayed at the Hotel Cortijo Blanco twice, recently in Dec 2003 and a few years ago, March/April 2000 and on both occasions I have enjoyed myself immensely. 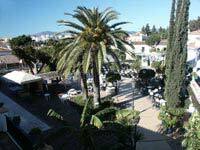 The Hotel Cortijo Blanco is located close to the village of San Pedro de Alcantara and Puerto Banus, about 10 minutes walk from San Pedro and 20 minutes from Puerto Banus. 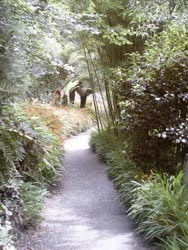 It is also located close to the N340 motorway which passes about 80 metres from the front door of the hotel. 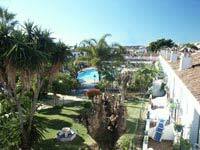 The hotel is also approximately 800 metres from the nearest beach. Those thinking that the N340 is a busy road are right, it is, but the noise from the road doesn´t really interfere with the hotel as the main accommodation is away from the road and the hotel itself is actually lower than the level of the road. The only time the road really interferes with the hotel is if you wish to cross it! Its at least a 10 minute walk to the safety of a pedestrian crossing, attempting to cross at any other place is suicide, although that doesn´t deter some people. You have been warned! 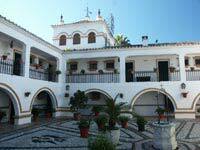 The hotel itself is built in the traditional Andalucia style with white walls, fancy brick work and a tiled roof. The older part of the hotel, which is towards the front of the grounds, is only two stories high, with the newer section at the rear, having three stories. 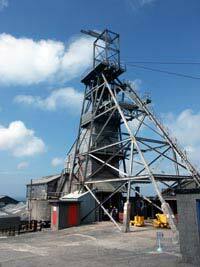 All the buildings have been built to complement each other and are all in the same style of design. As you enter the hotel you are greeted by a floral courtyard which leads off to the main pool and leisure area. Also the Bodega Bar where all the evening activity takes place when the weather is not good. 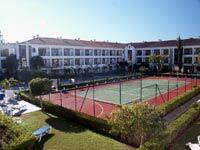 The main courtyard is quite large and is home to the main swimming pool, the outside bar and the restaurant. Situated around this area are the older rooms of the hotel set on two stories, all with balconies. Some of these are quite small and have only room to place one or two chairs outside but for the most part are quite large. The bar area is covered in chairs and tables which surround the central bar area. To one corner of this area is a small stage where many of the day time activities take place and most of the evening events, weather permitting. As you walk through from this part of the hotel to the new part you will notice a full size tennis court and another smaller swimming pool, more of a paddling pool really. Surrounding this area on two sides are the new three storey apartments and on the other two sides back the older rooms. If you want piece and quiet during the day this is perhaps the best place to be, however the sun doesn´t reach some areas of the hotel until mid day due to the height of the new buildings. There are also Self Catering and Villas to rent on the Cortijo Blanco site and these are situated at the opposite sides of the roads which run by the side of the hotel. First impressions of the rooms we have had on or two visits have been mixed, the first time we stayed we where located in the older part of the hotel, right behind the stage as a matter of fact, and this part of the hotel seemed extremely clean and the rooms where both spacious and nicely furnished. The last time we went our room was located in the newer part of the hotel and although the rooms where extremely clean they have a more lived in feel that the first time we stayed. The bathrooms are your average Spanish holiday hotel, with bath room which was clean with sink, toilet, bidet, bath and shower combined. All rooms have a TV and most have AC. Our room had two single beds! and an easy chair. The only criticism I have of the room was that the furniture was past its best, but we went at the end of the season and it was probably suffering from a year of abuse. The patio was a fair size. Enough for 4 chairs and a smallish patio table, however you couldn´t sit round the table only in a line. Our room was also south facing so it was nice to get up and go and sit outside in the sun first thing in the morning. As we went all inclusive, food is all important and the food at the Cortijo Blanco varied from day to day. Some days the food was Superb other days it was average, I put the average down to expecting excellent everyday! There was always a good choice every meal time, so there was something for the fussiest of eaters. Breakfast was served every day from 8am to 10am, lunch was 12:30pm until 3pm and dinner was 6:30pm to 9pm. However if you missed a meal there is a separate smaller restaurant next door to the main restaurant which served snacks throughout the day and up to midnight. Afternoon tea was also served in the Bodega Bar at 5pm. The staff at the hotel are brilliant and even though it has been 3 and a half years between our visits nearly all the staff who where there the first time we went where still working there. 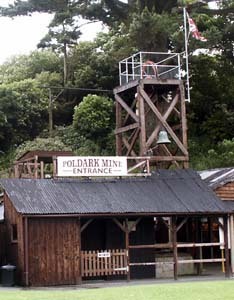 Most of the staff speak excellent English and German and always try to speak to guests through the day. If you want to go for a walk around the hotel or to the beach there are many little roads which surround the hotel and once outside the main side exit of the hotel you can see the beach, albeit 800 metres away. The beach at the bottom of the road from the hotel isn´t very good but another 5 minutes walk along the coast the beach is fantastic. The area around the hotel is not very commercialized, there is a supermarket, a few bars and a few restaurants close by, but once you leave the area near the hotel then most of the land is either undeveloped or residential, however things are changing as there was a lot of building going on away from the hotel area. Most of this is going to be residential though. If you walk along the main road, which is not for the faint of heart, in one direction is the town of San Pedro de Alcantara which is a traditional Spanish town with shops, a town square and a market once a week. You can buy your fags here, just walk up the road at the side of the bus station near the pedestrian crossing! 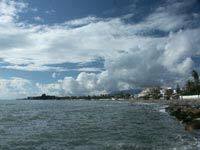 In the other direction is Puerto Banus which is known as a millionaires playground. The town is full of expensive shops which my wife took great pleasure in walking round and scaring me by threatening to buy stuff! However, the prices where extortionate and my wallet stayed firmly shut. There is also a large department store, Hypercor, in the heart of Puerto Banus which offers everything from fags to fridges! Some of the staff may speak English but most don´t and they will let you know it. If your going to go to Puerto Banus then my advice is get a taxi, its 10 euros each way, it´s safer and it´s quicker than walking, that is unless you walk down the beach as we did. While in Puerto Banus you must go and walk around the harbor and look at some of the splendid yachts moored up. Some are reputedly worth 12 million dollars! However beware as some owners don´t like you hanging around their boat too long! W*nkers.